When I began running beginner quilt making classes I asked my Twitter friends what advice they would give beginners. I got great responses and I thought I'd publish them on my blog. I'm pretty sure I never got around to it. And even if I did, I think they bear repeating from time to time. And seeing as I'm running another set of classes at the moment, now is as good a time as any! Thanks guys, and even if you're not a beginner, take the time to read the list. Sometimes we need to remind ourselves of the basics. And that it's okay to use pretty fabric! The importance of the 1/4" seam. Being as accurate as possible in every step makes a better end product. But have fun! 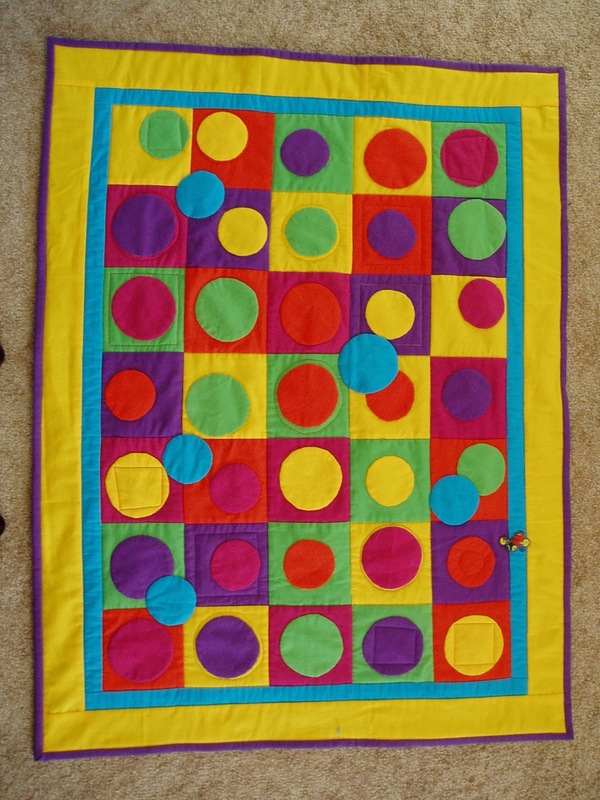 Always square up your blocks when you're done piecing them. 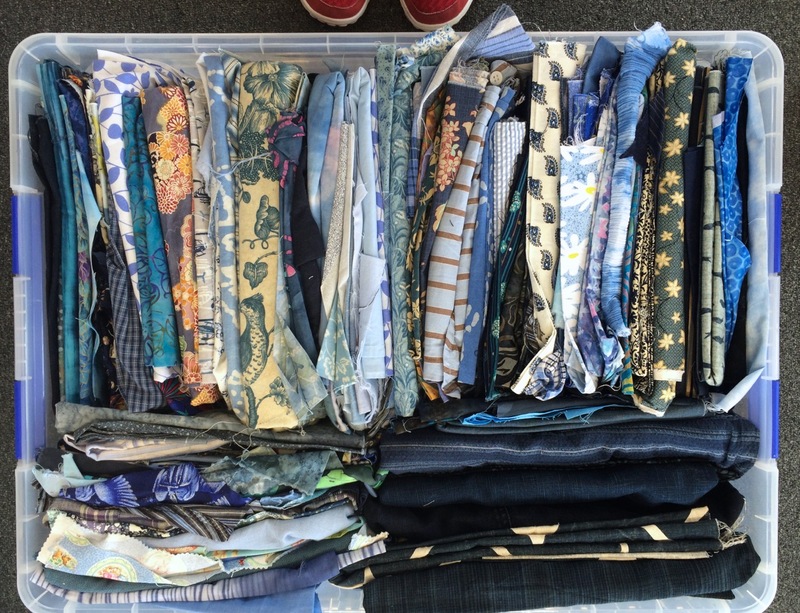 Wash and dry fabrics first! Measure twice and cut once - saves on fabric AND frustration!! Regarding mistakes -If you can't see it from a galloping horse, don't worry about it. Advice that set me free. And practice makes perfect. We all start out crawling before we can walk. “Don’t worry, it’s just fabric!” Spent too long hanging onto pretty fabric I was afraid to cut into. Make friends with your seam ripper. Play and have fun. enjoy the process. Measure with lines on ruler, not cutting mat. When a seam doesn't come out right, set it aside, try again on the next one. Rip out later. you will learn and enjoy more if you join and engage with the quilting community. Life is short. Use pretty fabric. JMO. 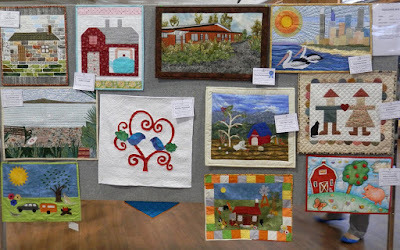 Start with a small project, wall hanging, pillow cover, bag. 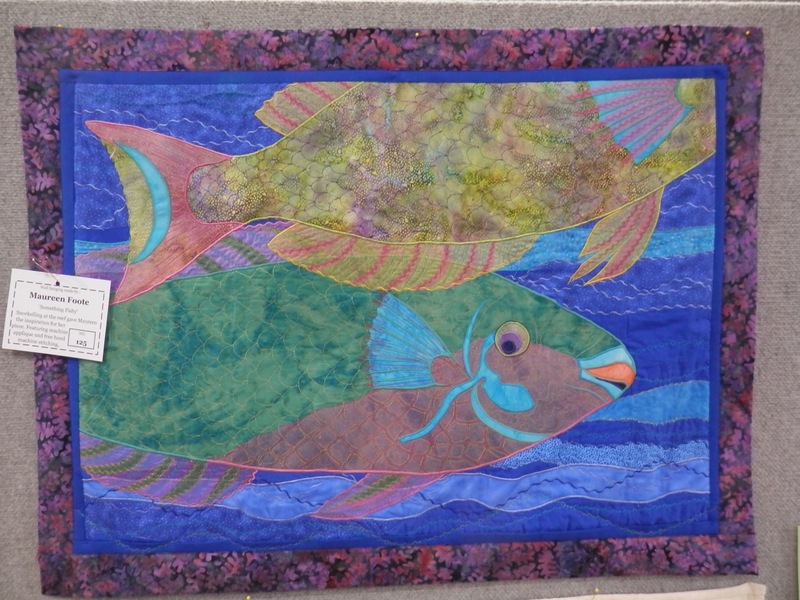 And just for kicks and giggles, here's one of my earliest quilts. The appliquéd buzzy bee on the first border hides a little scissor accident. None of the circles are perfect. The colours are OMG bright. But it was loved and cuddled by the child I gave it too, and that's what counts. 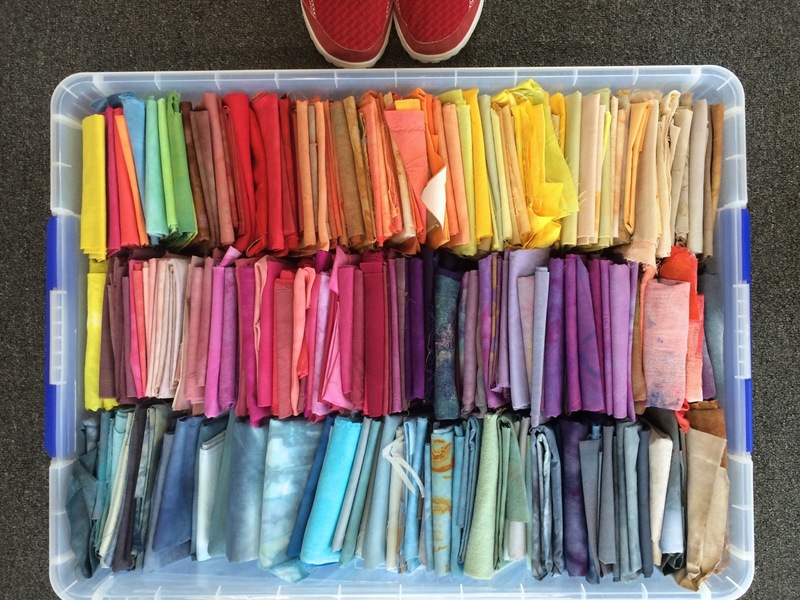 I'd love to hear your best piece of advice for the beginner quilt maker, leave me a comment and I'll be sure to pass them on to my class. Last week seemed a busy one. 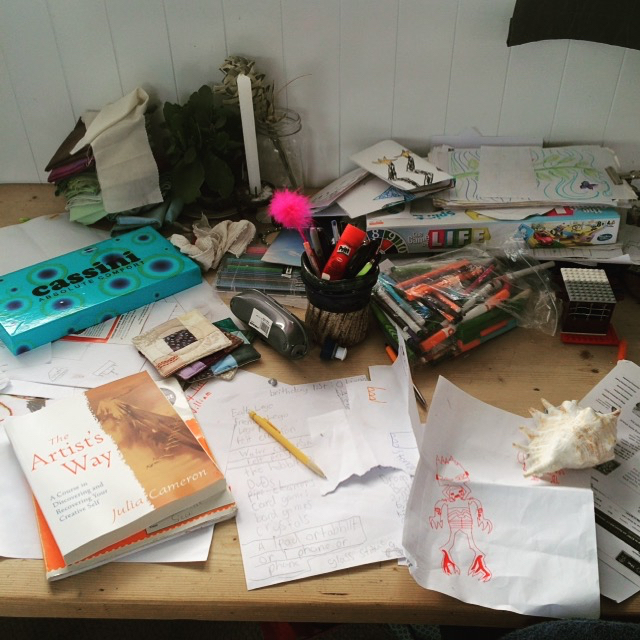 All my weeks seem busy at the moment - and I don't necessarily believe this is a good thing. I don't subscribe to the 'busyness' ideal that seems to pervade our lives. I like to have time to be slow, to enjoy, to watch and listen. But that doesn't seem to be happening much lately. Maybe I have to make time. But at least I've been busy doing things I enjoy. Well, mostly. Housework will never go away, no matter how busy or un-busy I am. I've been free-motion quilting this little wall hanging. I even got most of the binding on too (let's not talk about the hanging sleeve shall we?). I got to spend some time at the beach watching these two little loonies. 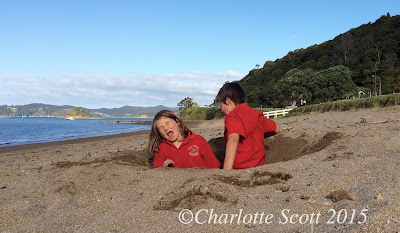 Love that expression on her face - her big brother just landed in the hole next to her after taking a flying leap. I took a walk while they dug and snapped this pic. We live in a truly beautiful place. I hope I never get too busy to notice. I spent some time appliquéing this piece of work. 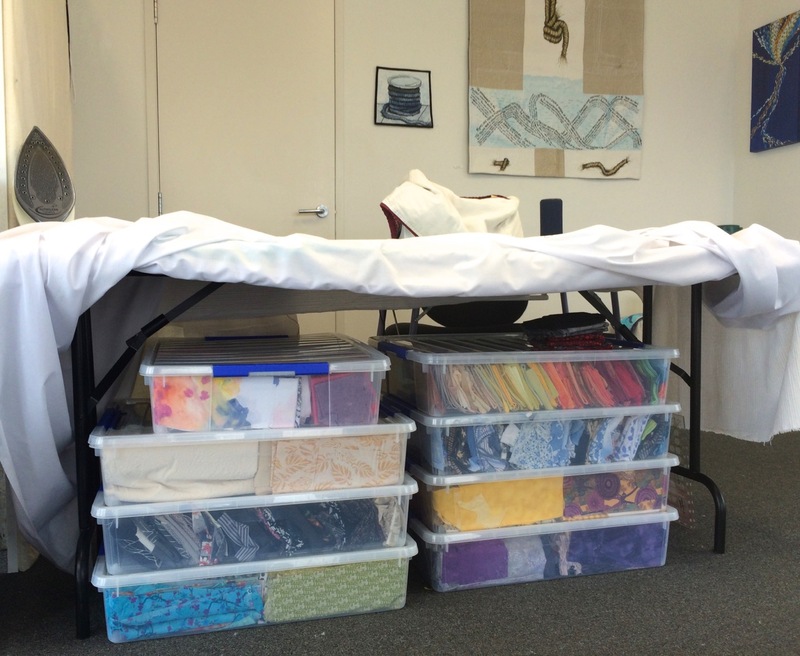 I also spent quite a few hours auditioning fabrics for sky, placement of elements, thread colours etc. But I'm glad it's finally coming together. Once I start sewing, I can make an ever decreasing number of changes and it becomes easier to just accept it how it is, not what it could potentially be. The dye studio has been calling my name again and I've been dyeing some skeins of thread. These four colours got two dyeings. The first time around I forgot to untie the loose knots I use to keep the skeins tidy, and even though they were loose, they made a stripey look - unintentional shibori. But over dyeing worked and I managed to get my colours very close to the original ones I had. And then I was busy tooting my horn! 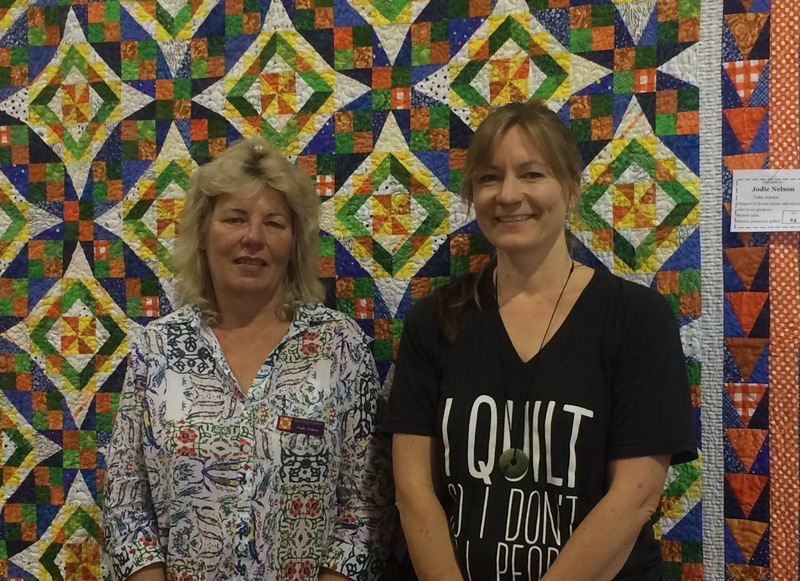 New Zealand Quilter, the only New Zealand based quilting mag available, published an interview with me! Stoked! It's a great issue - also featuring my good friend Mathea Daunheimer with an article on her viewer's choice winning quilt, a write up about my local quilting club, the featured blog was the blog of another quilting friend, Leeann, and there were lots of other interesting articles and pretty pictures as per usual. 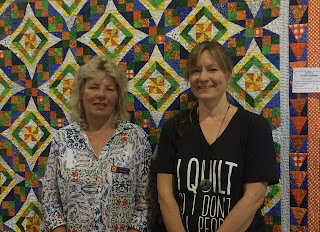 Thanks NZ Quilter, and Norma Slabbert, who wrote interesting questions for me to think about. Next week promises to be busy too. But I'm going to be mindful of spending a few hours not worrying about what I should be doing next, just sitting and enjoying, and feeling grateful for all I have. I thought I'd share a few images from the latest art collection that I've curated at Opua Arts Studio and Gallery. There are more works of art to see besides these so, if you are in the area, do come and see me. 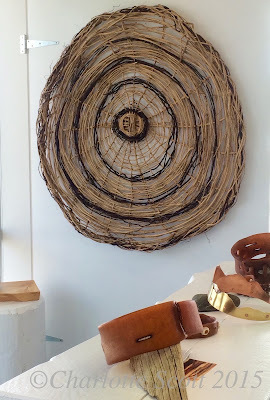 Contemporary weaving by Carolyn Lye. This is called 'Dune's Eye'. Paintings by Sandy Wright, bull kelp sculptures by Carolyn Lye and the crown, called 'Crowning Glory' is by Tui Slater. 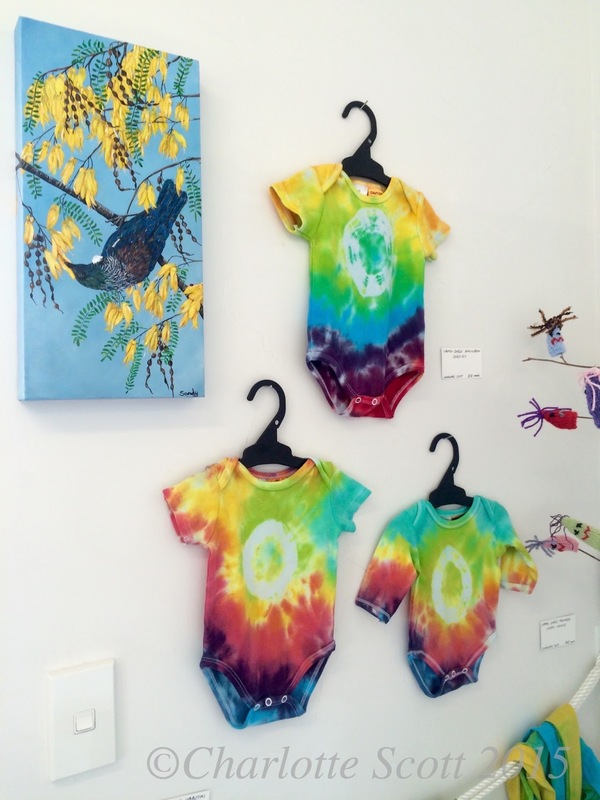 And the whimsical corner with some rainbow onesies by me! Painting by Sandy Wright. 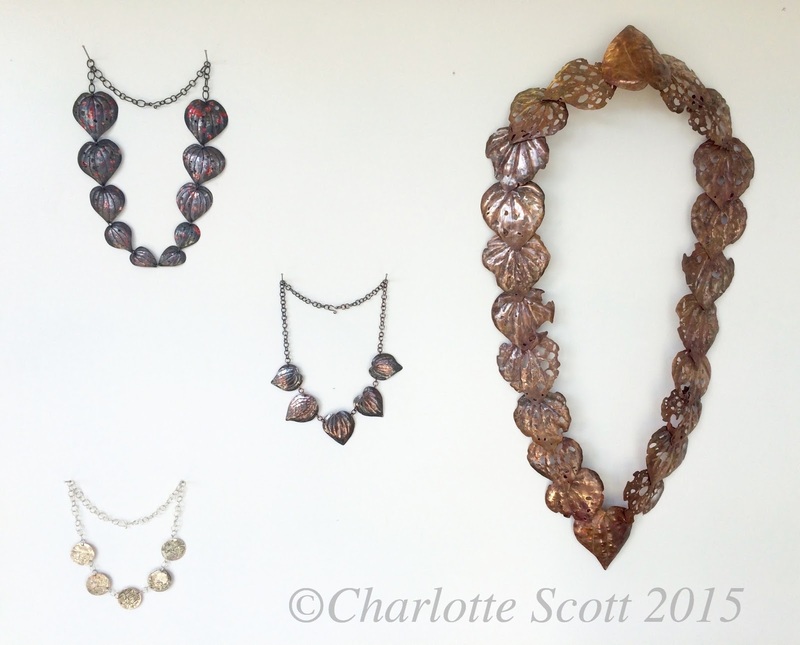 I also have work by Mathea Daunheimer, Mieke Apps, Jane Shaw, Adrienne Barrie and Andy Cogar. I spent the last two weeks of September and into October in Australia. We had a couple of family birthdays and had managed to organise gatherings around the celebrations. 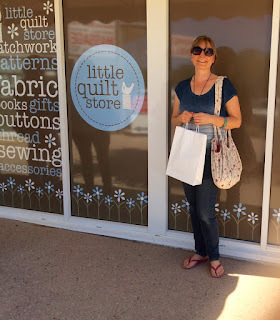 It was a full on couple of weeks and most of it was spent with family, but I did sneak in a couple of quilt related outings. I got to meet up with some lovely SAQA members (Studio Art Quilt Associates). 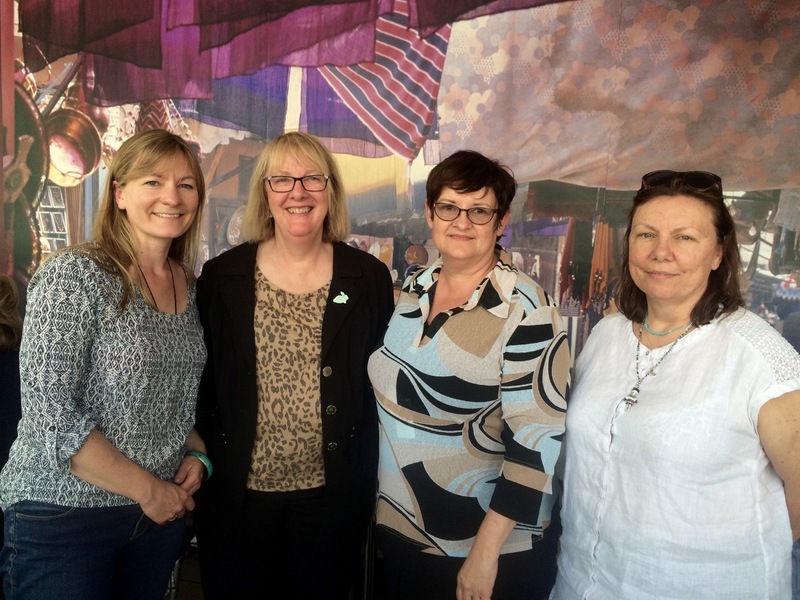 From left to right is myself, Rebecca Staunton, Ali George and Kate Oszko. A yummy lunch and some great conversation. 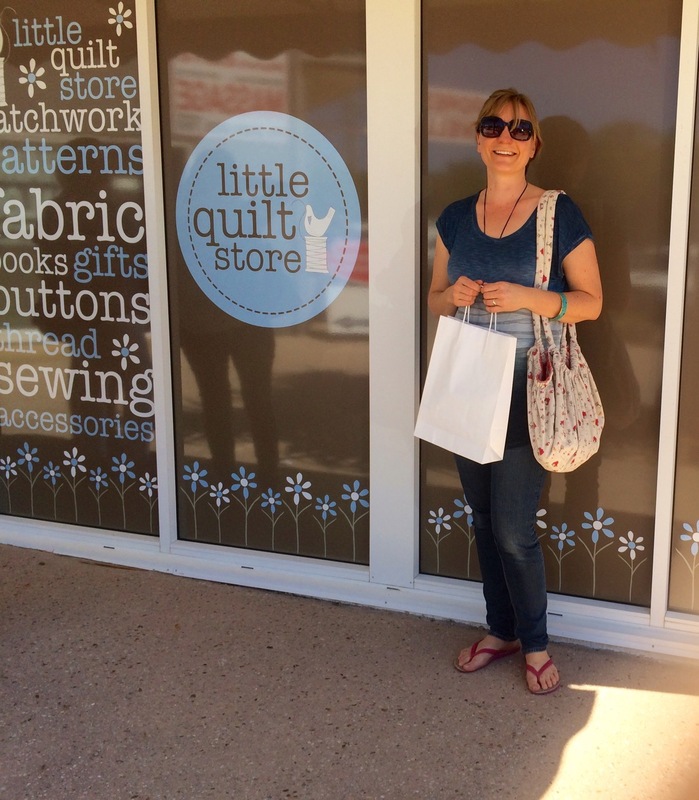 My stepmother and I visited Lynette Anderson's shop, called Little Quilt Store. It's only little, as the name suggests, but it is crammed full of Lynette's fabrics, plus some others, and if you like Lynette's style, you'll love this shop. I came away with a little something in the form of some half-metre cuts. My stepmum bought a some Christmas charm squares and I showed her how to make coasters - she was a whizz at it! 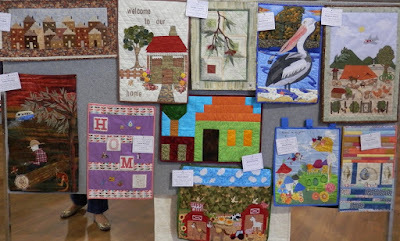 I also got to a local quilt group's exhibition, the Sew Crazy Quilters from Helensvale, Queensland. In a delightful coincidence, Lynette Anderson had donated the fabrics for their raffle quilt and a prize for their viewer's choice. My first interviewee was Carleen Condon. 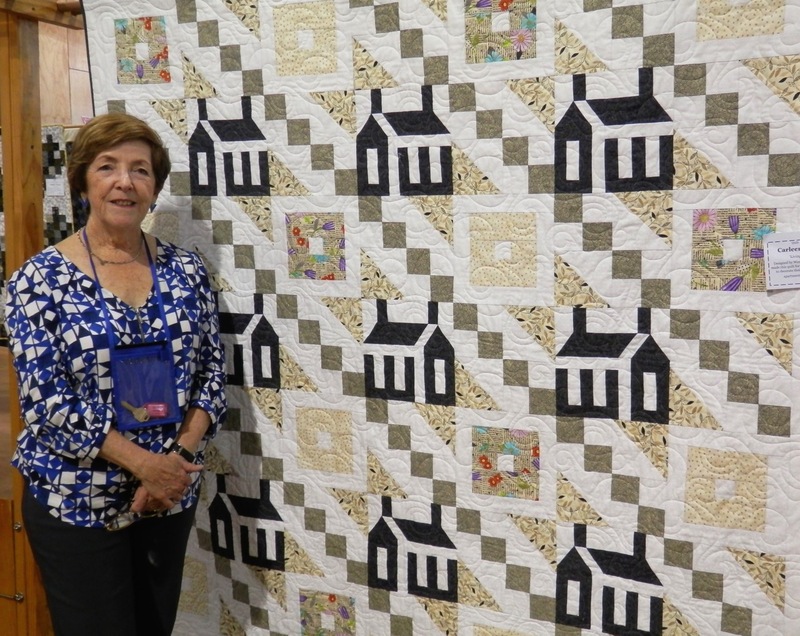 Her quilt is called 'Living in Town', from a design by Wendy Sheppard. 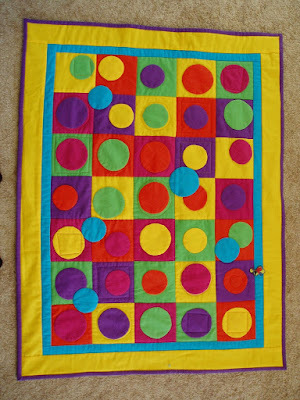 Carleen has made this quilt for her son and his fiancee for their new apartment. 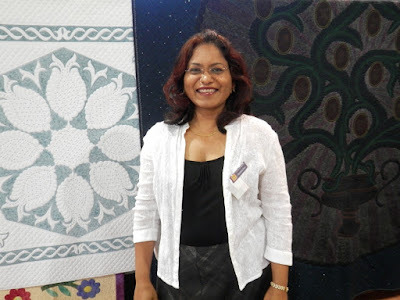 It was machine quilted by Manisha Hunt (who appears later in this post). My next guest was Jodie Nelson, who invited me to the exhibition through Facebook - the power of the internet! And she is lovely in real life too. 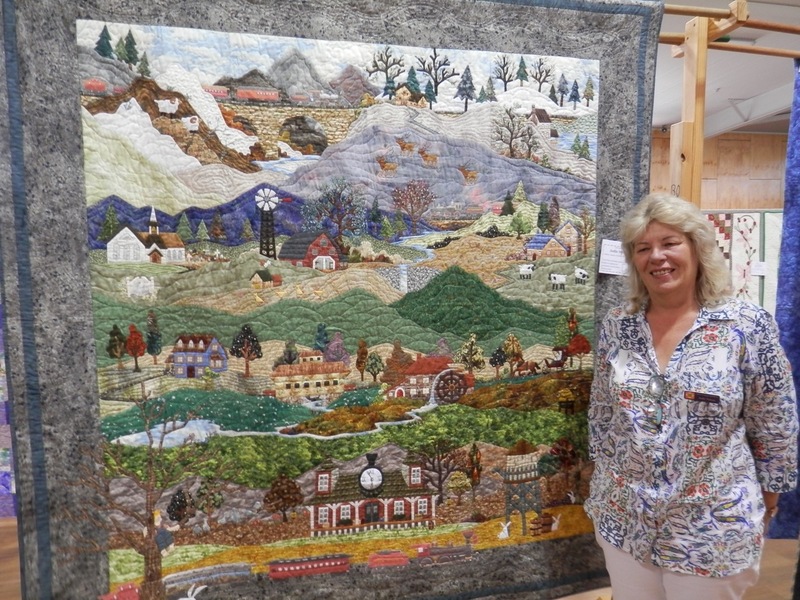 Jodie's quilt is a Piecemakers pattern and is called 'America, America, God Shed His Grace on Thee'. 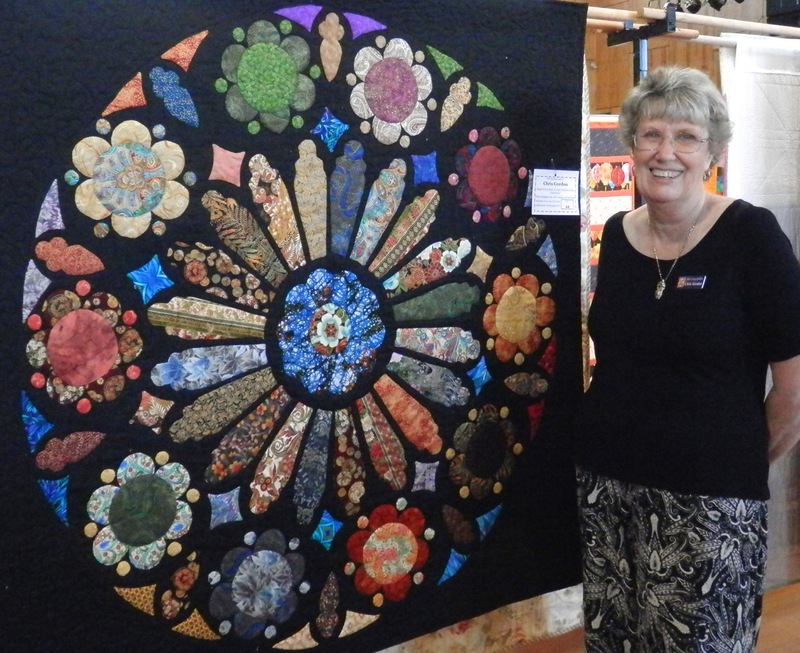 Chris Gordon is a past president and made this lovely Rose Window quilt inspired by a book on rose windows from cathedrals. 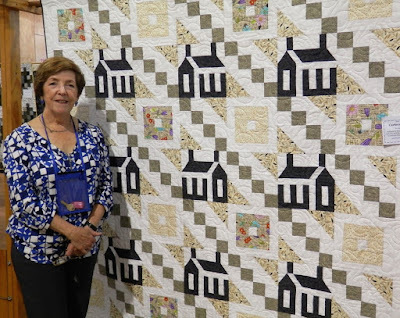 Chris designed her quilt from the rose window in the National Cathedral in Washington, DC. 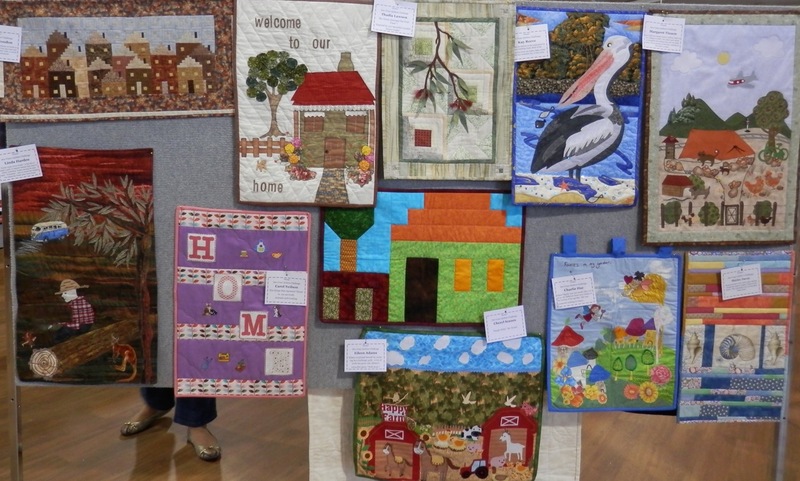 Chris also talked about the challenge entries - the theme was Home. 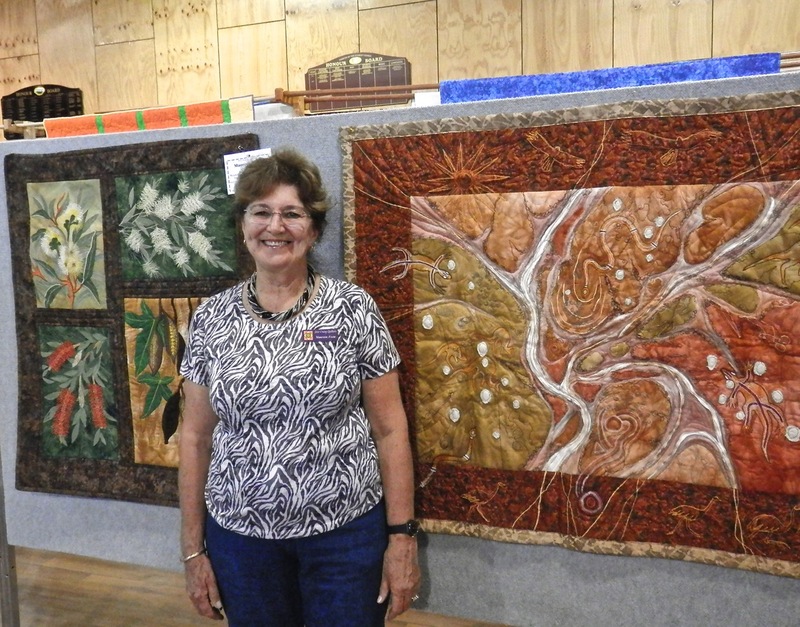 Thadia Lawson kindly answered some questions for me about her quilt 'A Touch of Contemporary'. 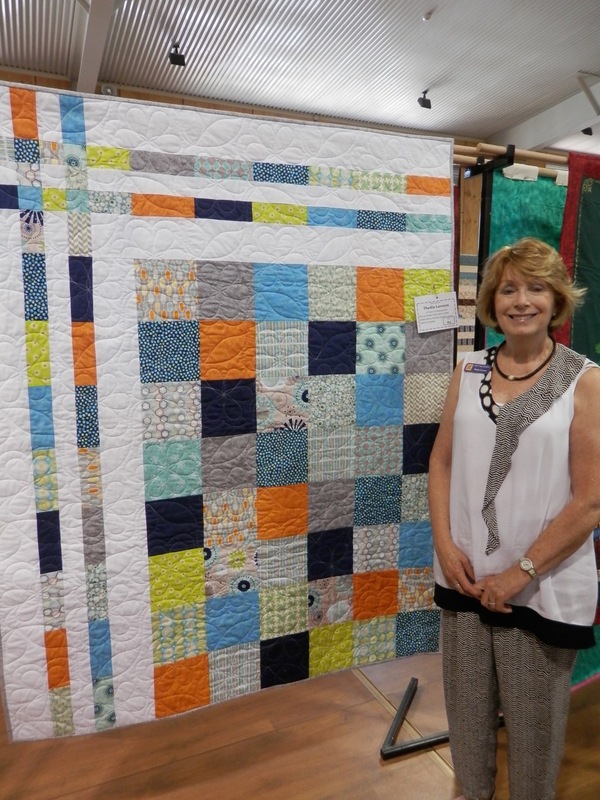 This quilt is for her Grandson and it was quilted by Stephen. Maureen Foote's quilts caught my eye with their innovative techniques and interesting subject matter. 'The River Runs Dry' is on the right hand side and 'Australia Fair' is on the left. This quilt 'Something Fishy' was also one by Maureen. My last guest, just before my batteries on my recorder ran out, was Manisha Hunt. Manisha Hunt is a professional machine quilter for hire and had some of her beautiful quilts on display. 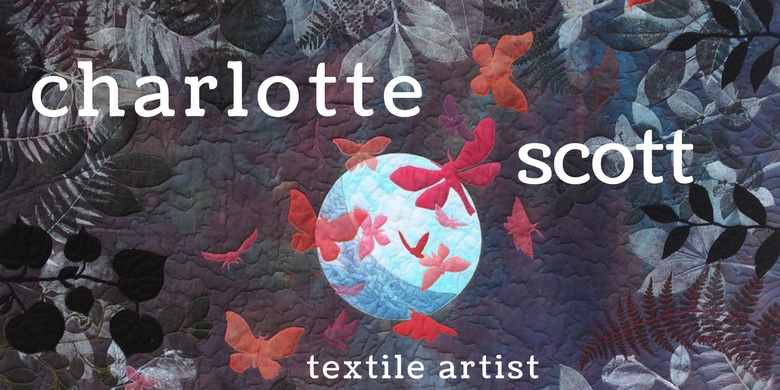 Her website is here: http://quiltandcraftstudio.com/quilt-gallery/client-quilts/ where you can see some of her lovely work. Thanks again, you were all lovely to chat to!